The success of the whole research enterprise relies on the integrity of academics. At an absolute minimum, there is an expectation that researchers don’t fabricate or falsify their data, and don’t plagiarize the work of others. More than that, there is an expectation that researchers work responsibly – according to accepted standards and regulatory codes of practice. And ultimately, researchers should act with real integrity – transparently, openly, fairly, and for the benefit of society. Avoiding misconduct is one thing, but research integrity in that last sense is a tricky business. Researchers face many pressures and perverse career incentives that can compete with good practices. We know that questionable research practices are alarmingly common and there are well-publicized issues of reproducibility – even a “reproducibility crisis”. Some of the issues are outside of the remit of an individual researcher; it is hard to conduct research responsibly if you work in a toxic environment or if your institution fails to give you the tools to comply with best research practices, for example tools to store data safely and securely. One strategy for improving research integrity for individuals is training. The United States Office of Research Integrity recommends that research trainees be given formal training in the responsible conduct of research across nine “core practices” – including, for example, data management, supervision, peer review, authorship, and publication. In Australia, our primary funding bodies recommend much the same thing. But how should we actually conduct research integrity training? One option is to provide a standalone course about research integrity that covers all of those ‘core areas’ in a single unit. Indeed our institution, the Queensland University of Technology (QUT), offers a comprehensive online course that does just that. Importantly, we wanted to make the courses interesting and engaging – terms that are not often associated with integrity training. But, for the past two years, we’ve also tried something new – something we think of as research integrity by stealth. Our aim is to make a norm of research integrity practices by integrating research integrity training into practical training courses about publication and peer review, and framing it all in the context of researchers’ goals. We aim not only to address the core issues that anyone who works in research integrity will be familiar with, but also include evolving best practices in research and its dissemination, such as open access (which QUT has been a leader in), the value of ORCID identifiers, and the need for good reporting practices as championed by The EQUATOR Network. Importantly, we wanted to make the courses interesting and engaging – terms that are not often associated with integrity training. So far we have developed two courses – one on Authorship and Publication, and one on Journal Peer Review. We deliver each course as a half-day session that is broken up into short, snappy segments, presented in a variety of formats, generally no more than 10 minutes each, and often much shorter. Crucial to the development of this training was the careful design of conceptual maps that tie all the diverse topics together into a coherent narrative. 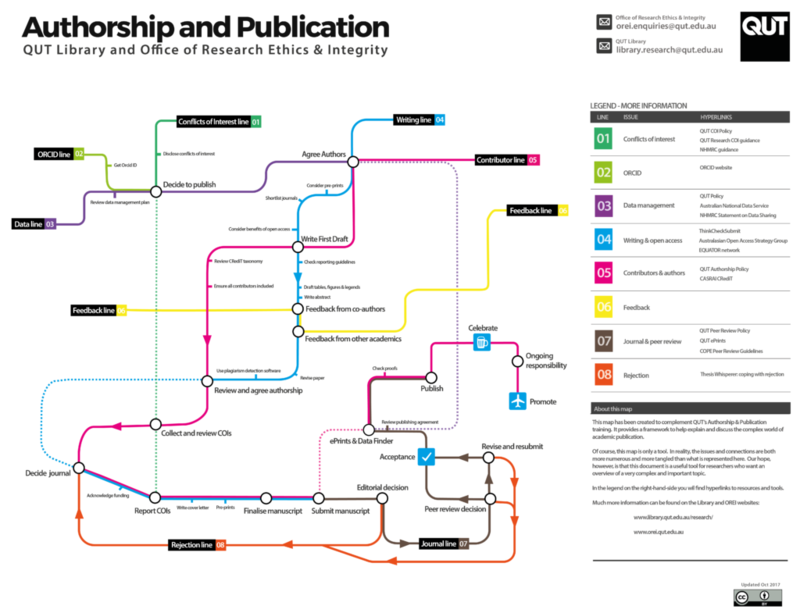 For example, the complex structure of academic publication is presented as a subway diagram. The course follows a journey through that subway, presenting topics via animated videos, lightning talks, and recorded interview snippets. Similarly, the Journal Peer Review course is structured around the concept of an industrial machine composed of many parts that have been added or changed over time. The history of journal peer review is recounted as an animated version of that machine, and evolving practices in peer review are discussed as innovations to different parts of the machine. Our core development team included a diverse group with expert knowledge, both from the Office of Research Ethics and Integrity (OREI) and the Library. We also sought academic input from across our faculties so that the course would fully reflect the diverse experiences and needs of academics across disciplines. This was a challenge to coordinate and the course development took around six months from conception to delivery. Subsequent delivery of the courses has required less work, although we are mindful of the need to update the courses regularly as new practices arise (for example we plan to introduce a more robust discussion of preprints at our next sessions). In the end there is no easy way to deliver content like this. Making courses that are engaging and relevant requires a substantial time commitment and a good local knowledge of the most relevant research integrity issues for academics in both local and global contexts. We have made some of the resources for Authorship and Publication and Journal Peer Review available under a CC BY license, and others might like to use or improve upon them. As we continue to develop these courses, we hope they help enhance the quality of training and engagement at QUT and beyond, and ultimately the quality of research. Mark Hooper (pictured) is Education and Cultural Change Coordinator for the Office of Research Ethics and Integrity at the Queensland University of Technology (QUT). He is a philosopher and learning designer. His PhD was about the philosophy of David Hume. Ginny Barbour is Adviser to the Library and the Office of Research Ethics and Integrity at QUT.Originally trained in medicine, she has been involved in open access and publication ethics for many years and was Chair of COPE from 2012-2017. Stephanie Bradbury is the Research Support Manager in the Library at QUT. She leads a team of experts who provide services in scholarly communication, copyright, researcher skills training and research data management.